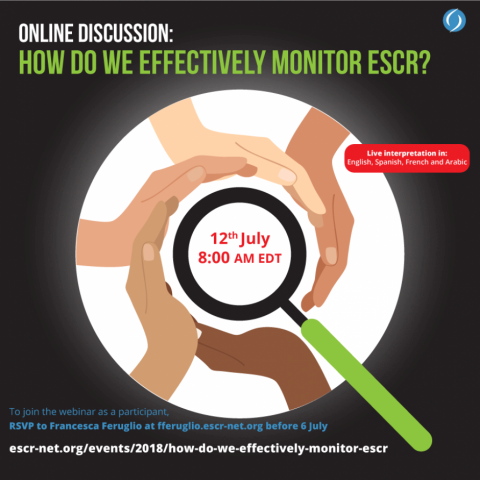 In this webinar we will outline how to develop a monitoring strategy that can support your ESCR advocacy and campaigns. We’ll go over varying approaches on how to: define what to monitor, gather the data, make sense of it, and communicate to others about your findings. Through practical examples, we will share how different organizations have used monitoring to advance ESCR at local and international levels. For instance, you’ll learn about how the Initiative for Social and Economic Rights in Uganda partnered with the Centre for Economic and Social Rights (CESR) and successfully advocated with the Human Rights Council to make a number of recommendations around ESCR, business and human rights in Uganda, and you’ll hear what CEGSS (Centro de Estudios para la Equidad y Gobernanza de los Sistemas de Salud) has learned through 10 yeas of gathering evidence on equal access to health services for indigenous groups in rural Guatemala. We’re going to ask you— and other advocates like you—to share your own experiences, questions and concerns with monitoring for ESCR. All ESCR-Net members — and allies working to advance ESCR in their countries or internationally —are encouraged to join! So please forward this invitation to your colleagues and friends. 1. Sign up for a free VoiceBoxer account. 2. Once your are logged in to VoiceBoxer, follow this link.